Officials want to know why a near-brand new Boeing plane crashed 13 minutes after takeoff in good weather. All 189 people on the plane are presumed dead. Indonesian divers reported seeing the main wreckage of the Lion Air jet that crashed into the Java Sea on Monday. They also retrieved two turbines and a wheel from the sea. Investigators also reported hearing a ping from what they believe is the cockpit voice recorder. Muhammad Syaugi, Indonesia&apos;s search and rescue chief, said investigators "made major breakthroughs" in their probe into why the near-brand new jet crashed in good weather earlier this week. Investigators lauded "major breakthroughs" in its search for the missing Lion Air plane that crashed into the Java Sea this week as divers say they found the main wreckage of the jet. Officials also reported hearing a ping from what they believe is the cockpit voice recorder. Divers from the Indonesian navy reported seeing the fuselage — or main body — and engines of the Boeing 737 Max 8 aircraft on the seafloor, Indonesia&apos;s search and rescue chief told reporters on Saturday. Divers also retrieved two turbines and a wheel from the sea, Muhammed Syaugi said. 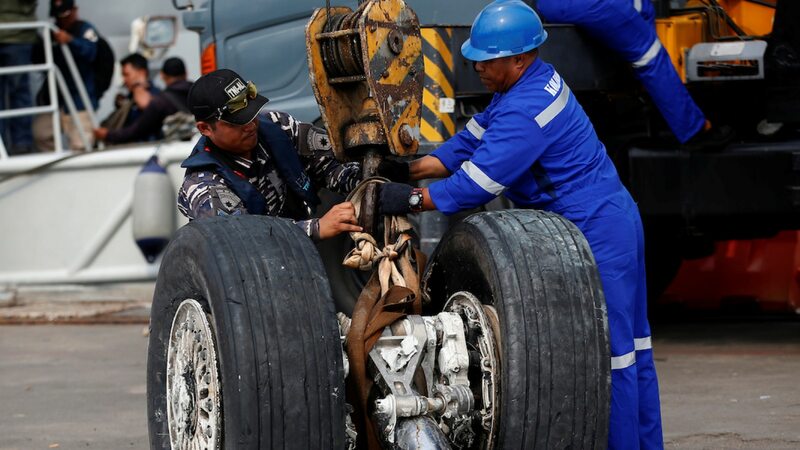 "We have made major breakthroughs as we have recovered two turbines, one wheel," Muhammad Syaugi told a press conference in Jakarta, as cited by Bloomberg. "There are reports of team members seeing the body of the plane." "I haven&apos;t seen it myself but I got information from some divers that they have seen the fuselage," he added, according to the Associated Press. The jet crashed into the Java Sea on Monday, about 13 minutes after takeoff. All 189 people on the flight are presumed dead. Pings from the voice recorder? Syaugi also said on Saturday that a sonar locator had detected "low ping signal," which could be from the cockpit&apos;s voice recorder, also known as a black box. On Thursday divers found another black box from the wreckage, which contains flight JT610&apos;s data recorder. However, it was found to be broken open and affected by sea water, and needs special treatment to make sure the data is accessible. Officials believe the data in the black boxes will help explain why the almost-brand new jet went down crashed into the sea in good weather. A pilot who flew the same jet the night before the crash issued an urgent distress call to signal technical problems with the aircraft, and requested to return to the airport before later changing his mind. The investigation has been marred by strong currents.